Find a low cost dumpster rental near you by viewing our service area map. We cover a very large area for roll off and dumpster rental service. We are proud to have a longer rental period with no extra charges. When you search for a dumpster rental near me you will find that a lot of haulers will charge you an extra fuel fee for going to certain zip codes. 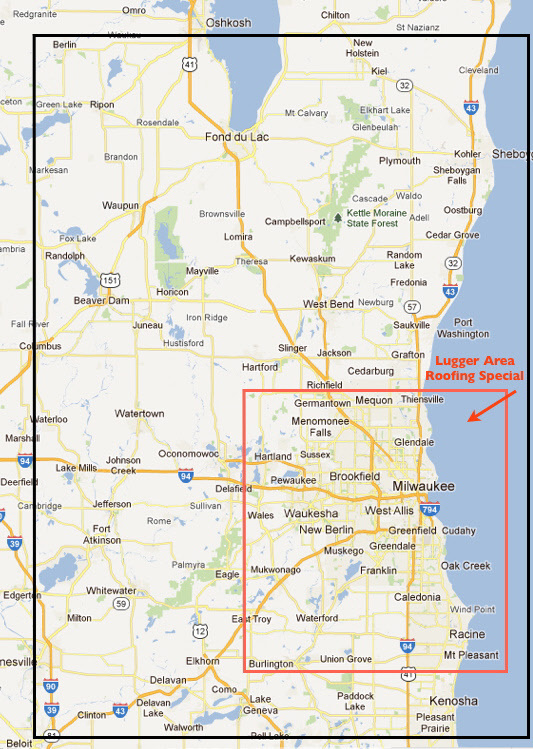 Notice that our lugger service area is marked clearly on the map and that luggers can be requested outside the service area but are not always available due to demand. How fast can I get a dumpster depends on your location to the most populated areas. Generally speaking dumpster rentals are delivered and picked up within a 24 hour period. We are a great source for all your waste management needs. Free dumpsters are provided through the city of Milwaukee. If you search for a public dumpster near me you will not find it listed anywhere on the web. It is a service usually offered by your local municipality in the Spring Summer or Fall. It is a city of Milwaukee dumpster. If you need to find a city dump site check our local dump page. We often receive calls inquiring about free dump stations or question of where is my local dump? We built this page to help you with smaller amounts of trash when you don’t need that large dumpster. Waste management service and information of these communities and surrounding areas near me and Milwaukee, Waukesha, Kenosha, Pewaukee, New Berlin, Mequon, Whitefish Bay, Fox Point, Racine, Wauwatosa, Port Washington, Shorewood, Cedarburg, Caledonia, Menomonee Falls, Mukwanago, West Bend, Kewaskum, Bayshore, Brookfield, Oak Creek, Bay View, South Milwaukee, West Allis, Elm Grove, Germantown, West Milwaukee, Elm Grove, Delafield, Oconomowoc, Slinger, Hartford, Hartland, Muskego, Germantown, Sussex, Richfield, Theinsville.